Someone recently emailed me to ask my opinion on making indie sequels vs brand new IPs and I thought I’d elaborate on my reply in a blog post. Caveat: This is just my opinion from what I’ve observed in this business for the past 13 years. It’s also presented from the perspective of being a full-time indie not a hobbyist or someone sitting on a giant pile of cash from wherever. Basically if you made a list of indie sequels that did well and ones that did not, I suspect you’d find that the list of “flops” (I use that term losely) is a lot longer. In fact there seems to be a generally held view amongst indies that sequels are a bad idea. Of course, one can always find exceptions, such as Democracy 3. I’m not going to call out any specific flops as that may be unduly cruel but I bet you can all think of some. – Only a small percentage of players of the original will buy the sequel. These are the true fans who loved the original and want more. However, any “meh” players certainly aren’t going to buy a sequel, and nor will players who have had their fill of the game and don’t want any more. – The game genre doesn’t lend itself well to sequels. In the download casual game market, the games are often short and designed to be played once, like how you’d read a book or watch a movie. Fans are then keen to play the next game in the series. However, some games are open-ended and players can sink many hours into them, such as sandbox simulation games, and so they may not be too bothered about playing a sequel which might not be much different anyway. – The original launched in the “golden years” of platform X and the sequel launched in the “indieapocalypse”. I’ve definitely seem this happen with some big name devs/games. Some people still don’t believe in the indieapocalypse but I think most devs are now coming round to the idea that certain markets have matured (e.g. Steam and iOS) and that people who got on them earlier had an advantage. I think this will happen to Switch soon like it has for PS4 and XBox One. – The sequel is too similar or too different. For example, I know of one game that got mixed reviews with players saying it should have been a DLC and felt more like a V1.5 than a sequel. The opposite is also true in that a sequel can feel so different (graphically, gameplay wise, or whatever) that it puts people off. Players have in their minds what a perfect sequel is and it is unlikely to match up with what the developer provides. In fact, some Regency Solitaire fans didn’t get on with Shadowhand (a prequel) due to us adding turn-based combat. We knew this might happen but were OK with it as we wanted to reach a bigger audience on Steam (and it worked). – Too much time has passed. Things move on; technology and the zeitgeist changes. A game that may have been cool and original 10 years ago no longer turns heads. Sequels can make a company go bust. A serious mistake that I’ve seen repeated many times is as follows: a company has a big success and expands their studio and ploughs all their money into a bigger and better sequel (or new IP), which then flops. Or even if it does OK, it’s still not enough money to pay for the expanded team and development time. This should be avoided at all costs. Thinking you have a magic formula in game dev is a very big mistake imho. Anything can go wrong. The first success may have been an unrepeatable fluke, and in fact PROBABLY WAS. Expecting to repeat that sucess (“catch lightning in a bottle“) is not wise. You wouldn’t expect to roll a double six twice in a row, so don’t bet your house on it. Not that I’ve been fortunate enough to have a big hit, but if I was, I’d put about 10% of my money into the next game and try again with a relatively quick game in order to trade off the success of the previous game. Why is new IP risky? As I’ve mentioned above, there can be a tendency to “go big” for the next game if the first game was a success, which can cause real problems if the new game doesn’t do well. This is compounded when making a new IP instead of a sequel because (mostly) everything has do be done from scratch (if it’s a new genre too) and not much can be reused which can result in a longer development time. This can severly affect the $ per hour earned from the time spend making the game. Also fans of your first game may not be interested in the theme or genre of your new IP. They may not care at all about the dev team that made it if the theme/genre is a severe mismatch. I saw this happen in an extreme case recently where a team that made a multi-million selling game released a much poorer-selling game that looked or played nothing like their first game, thus squandering their original player base’s goodwill. In fact, I’m pretty sure many players just don’t care about studios or “indie rock stars”. Sure, a few do, but I think there’s way more of this sort of “fanboy/girl” stuff in the game dev industry than amongst actual customers. So beware of that too. Furthermore, your new IP may be moving away from a successful theme/genre into a less successful one. This is very hard to predict especially as what is popular constantly changes. Now to the point of my article, gosh! So I’ve established that sequels are a bad idea and so is new IP, which leaves nothing left except going out of business. That may be closer to the truth than I’d like to admit, but I do believe there may be some light at the end of the tunnel. – Make a sequel QUICKLY. If you can make the sequel using the same tech, with a few improvements (based on feedback from the first game or ideas you didn’t have time to implement the first time round), but you control scope to get it done quickly, then I think that can be worth it. This is based on me seeing successful sequels in the casual download space which improved upon the original but not so much as to be a giant delayed project. The undoubted master of this is Jeff Vogel, who has been making very similar RPG games for 24 years. – REUSE your engine for a new IP. An alternative is to do what I’ve done with my games which is to reuse the engine but for a new IP in the same genre. 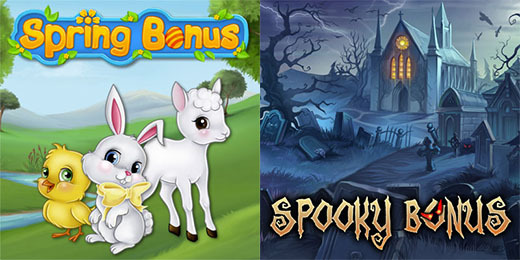 This gives you the chance to try out a different theme which may be a better market fit (like when I made Spooky Bonus using the Spring Bonus engine). They aren’t simple “reskins” but a proper retheming with different elements and a few improvements. This can be done quite quickly and at low cost so isn’t very risky. Also, if you can name your new games in a way that makes them sound similar to the other ones but not appear as obvious sequels, then you can end up with a bunch of fans who buy them ALL. A friend of mine likes to call this the “franchise effect”. It’s certainly happened with my games. But I want to make a completely new game! People often ask me if I get bored reusing my engine and making similar game. Well luckily I enjoy refining the concept for each game that I make, and because it lowers my risk, I get to stay in business. Of course I’d also like to be making cool new things but I sate that desire to some extent by doing game jams and making small games just for fun and to improve my skills. I realise this approach is not for everyone, and that’s fine. But I have to balance idealism with realism in order to stay in business because I do not have a warchest of cash. Perhaps things will change in the future, but that’s where I am for now. This entry was posted on Tuesday, March 27th, 2018 at 3:15 pm and is filed under Business, Game Development. You can follow any responses to this entry through the RSS 2.0 feed. Both comments and pings are currently closed. Ooo, I like the subtle foreshadowing at the end there! Looking forward to hearing more. And as always, thanks for sharing your thoughts. I find your method not only wise, but also fitting to how my wife and I want to approach game development ourselves going forward! The more it changes, the more it’s the same thing. This is the approach that was most put forward soon after the heydays of the Flash game market, several years ago. It’s also a good tactic to avoid burnout: being realist about our capacities, and humble in our ambitions. Unfortunately, or not… I absolutely do agree with you in everything what I just read. I’ve shared the article in hope of others will see it as well – because they should.